This page contains two Reviews from Kunyu academy . 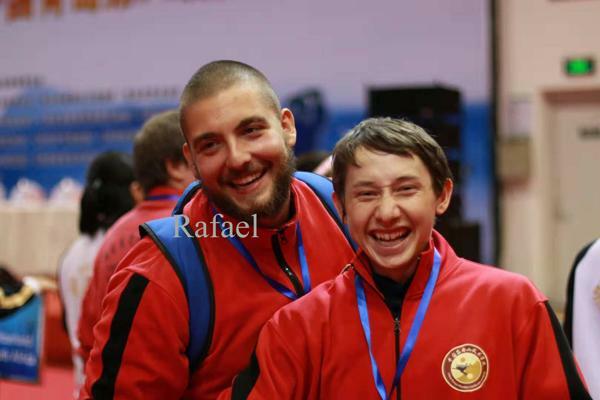 Rafael is on the left of photo in Qingdao international Kungfu competition. 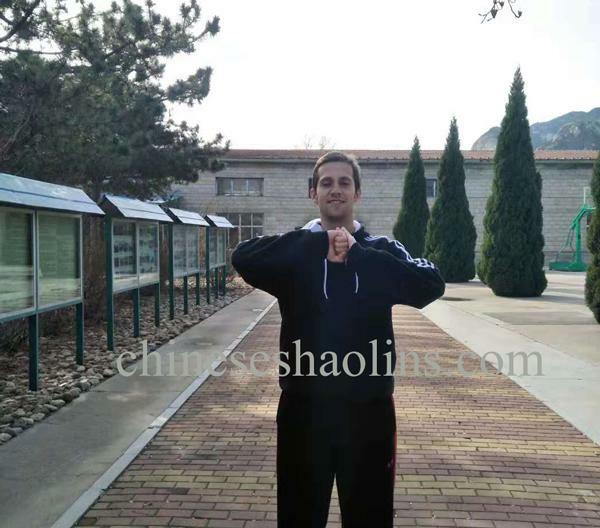 I chose China to study kungfu because it was a dream of my childhood to visit China one time in my life. I also started to feel the need of active training for my body and my mind. I tried to find a school that teaches Kungfu in my hometown but I could not find something that in my opinion would fit my needs. I gained a lot of confidence in training my body and training with my body. I didn’t know that I was still able to do some things. I found what I was looking for Qigong is one of the classes that helped me learn another art of meditation and I will perform Qigong back home. As well Tai Chi. I fit perfectly into WingChun and Baji and I thank anyonewho was there when I needed them. Especially I am very happy to have had Master Guo and Couch Loc as my teachers! I want to thank them on paper and I will of course personally. I was happy with the accommodations. I did not come here with expectations! I came here to learn anything I could and I did.I am happy that I had the possibility to be a part of the Kunyu Mountain Aacademy. Thank you! I chose to study Kungfu in China because I wanted to go somewhere complete different where I have not been before and also because the Chinese are the best at Kungfu. I wanted to come here to be a more independent person in a different environment and clear my mind and get fit and healthy,which I feel I have achieved. I have had great help from the moniters and Master Guo, coach Loc. Istruggled to get used to wingchun for the first month but thanks to the coach and master I feel that they didn’t give up on me. The school is a great place to be. The staff are all friendly and helpful. I will definitely come back again and recommend my friends back home to come here. The surroundings here are beautiful, I love walking up the mountains looking at the nice views and training up the temple over looking the montain and lakes is very good. Yantai and Muping are good places to shop and get good food. Thanks for having me here.